Laser dentistry is one of the most sophisticated advances in dental technology available today. 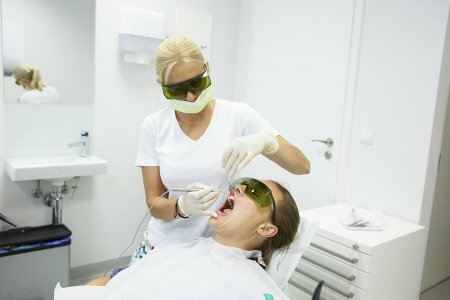 Not every dentist offers it, but those who do tend to gain a reputation among their patients for providing remarkably gentle, pain-free care. In fact, many patients find that they no longer need the local anesthetic that turns the mouth numb. Laser dentistry is an effective alternative to conventional treatments for tooth decay removal, gum disease reversal, oral growth removal, and even tongue tie correction. Albert Einstein didn’t create the first laser, but he did propose the theory behind it—the concept of stimulated emission through photoelectric amplification. Later, in 1959, a graduate student at Columbia University built the world’s first laser. Laser is actually an acronym for light amplification by the stimulated emission of radiation. The first one was based on helium and neon. Later models of lasers were invented using other elements, such as argon. The first medical-grade laser was introduced in 1963 . Dentists first began exploring the use of lasers in their field during the early 1960s. Initially, dental lasers used a ruby for the laser medium. The device emitted irregular pulses, and it successfully vaporized tooth enamel. However, there were concerns about the safety of this technology, as some researchers thought that tooth pulp might sustain damage. Moving on from ruby-based lasers, dental researchers began investigating the possibilities of CO2 lasers and Er:YAG lasers. Their efforts were rewarded with the 1990 release of the first laser system developed specifically for clinical use at dental offices. Today, the technology continues to evolve, giving patients access to more effective—and gentler—treatment possibilities to support their oral health. Glenwood Premier Dental is pleased to offer Waterlase laser dentistry to our patients in Hazlet. As one of the most sophisticated systems available to dentists, Waterlase has a remarkable capacity for effectively healing dental problems, without the discomfort of conventional approaches. Call (732) 264-4477 to request a consult with one of our dentists.